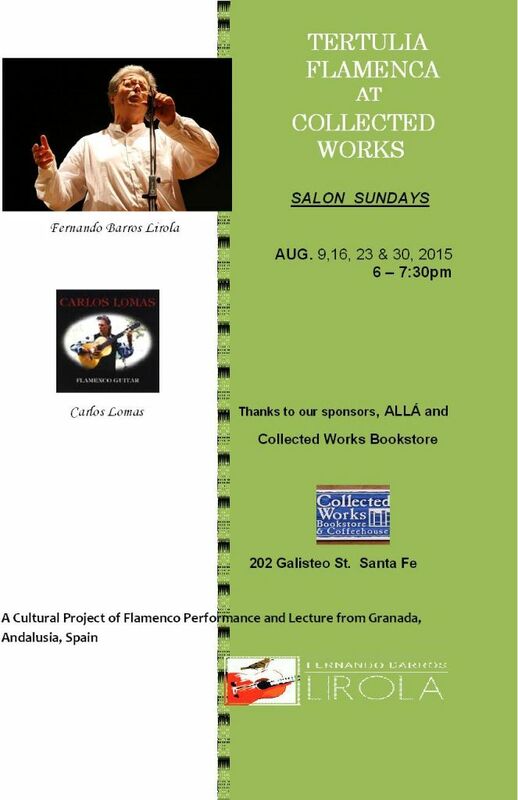 The Tertulia Flamenca Series at Collected Works is a cultural project of flamenco performance and lecture from Granada, Andalusia, brought to Santa Fe by Fernando Barros Lirola. Fernando grew up in Granada, Andalusia, where as a young boy, he discovered the history of flamenco and the extraordinary flamenco voices in the caves of Granada, learning from the Gitanos (gypsys). 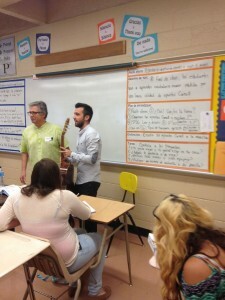 As a cultural ambassador of Andalusia, Spain, Fernando has recently relocated to Santa Fe where he has the pleasure of bringing his deep knowledge and understanding of flamenco together with his unique innovative expressions of literary flamenco performances. As a Master Teacher of Flamenco, Fernando’s extensive research, documentation and teachings will reveal the depths of historical influences, as well as place it in the ever-expanding global music scene. Innovative musical interpretation will include live and video settings for the poetry and prose of four exemplary writers in Spanish history: Miguel De Cervantes, Antonio Machado, Federico Garcia Lorca, and Juan Ramon Jimenez. These flamenco literary and performance gatherings are open to all in a natural collaboration with two of Santa Fe´s most important community bookstores, Collected Works and ALLÁ, the only Spanish language bookstore in the region. “Salon Sundays” are open to the public and participants are invited to attend one or more evenings as each performance will have a different author at its root. The hosts of this limited engagement are Fernando Barros Lirola, cantaor and founder of the International Center of Flamenco located in Santa Fe and Carlos Lomas, renowned innovative guitarist with deep links to flamenco luminaries. To revitalize each poet´s lyrics, to remember his legacy and to recapitulate the lineage of the music, form the vital part of our desire to present this innovative performance. Additionally, the styles will be explained and the musical harmonies emphasized, along with the lyrics of each of the poems where the themes of light and water illuminate each poet. The proposed activity features the aforementioned authors, but will mainly focus on three renowned Andalusian poets: Juan Ramón Jimenez, Antonio Machado and Federico García Lorca. Our goal is to reveal the poetic and symbolic work of these three great Andalusian poets who are universally known and renowned. We will reveal how each piece closely links to each individuals´ life and work as well as to flamenco. August 9 – “I Sing as I Read” by Miguel De Cervantes. Understand how the musicality of the Castilian language has conditioned the creation of flamenco music. Understand the musicality and rhythm of the poems that serve as the basis for singing as well as to mastering the art of reading and recitation. Romance de Altisidora. Guajiras, colombianas and tanguillos. “En un lugar de la Mancha…”. The letters and lyrics of Antonio Machado reflect a certain musical interpretation and are sung in the inherent genres of bulerías, Colombianas, vidalita, etc. August 23 – Alma flamenco de Lorca. With Federico García Lorca, we will explore the multifaceted range of his lyrics represented by his seminal, most classic and innovative poem, “Poet in New York”, published in 1929-1930. “Romance of a Black Sorrow” – Bulería solea. “Murder” – Seguidillas and cabales. Unique poetic metrics and musicality accentuate traditional flamenco rhythms. Additionally, contents of the letters will reveal many of the sources of flamenco.